Definition: Snowboarding will be an in-depth look into all of the genres of snowboarding through the eyes of those who live it. We plan to create a film with the support of core snowboarding that will welcome the general public into our lives, and to share the complete picture of riding rather that just the homogenized competitive X Games style of riding most people associate with snowboarding. Ultimately, we want to inspire new people to go snowboarding for the first time, and reinvigorate current riders to get out there and enjoy their boards more often and continue to live the dream. 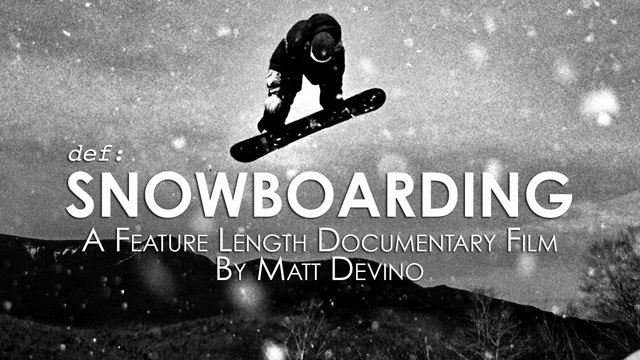 What: A documentary film project exploring the definition of snowboarding from the perspective of those who live it. Why: How does the general public perceive snowboarding, and where do they get this perception from? The main stream media does little to promote the simple joy of going out and riding a snowboard, whether it be at a resort, in the streets, or the backcountry. For most people, the only exposure they have to snowboarding is televised contests like the X Games or the Olympics. While contests are a big part of the overall snowboarding picture, they by no means, show the world what riding a snowboard is all about. This film will be a way to show the world how snowboarders perceive snowboarding, a way to let them vicariously experience our way of life, and to make new people want to go ride for the first time. Definition: Snowboarding is intended to reach a main stream audience the way films like “Dogtown and Z-Boys” or “Step Into Liquid” did for skateboarding and surfing while still holding to the expectations of core snowboarding audience. When: A two year project to be released in the Fall of 2015 including dozens of interviews and the documentation of all aspects of riding and the lifestyle that encompasses it. Interviews will be shot over the course of 2014 and exclusive riding footage will be shot during the winter of 2014/2015. Who: We are on a mission to bring together riders, media, brands, retailers and resorts to describe their vision of snowboarding and reveal this project to the world in an effort to showcase the complete picture of the snowboarding lifestyle. Not to sell our sport out but rather to welcome people into the scene by explaining through the words of its leaders why it’s so incredible to be a part of. How: We are working to rally every individual and the businesses they represent in support this project as we believe it’s vital to the future of this lifestyle that we all want to spend the rest of our lives invested in. Initial Crew: Film maker Matt Devino’s dream snowboard documentary is now set in motion and he will lead the direction and production of the project. He has, one again, teamed up with Brad Farmer to help produce the project and the two will undoubtedly enlist the help of several other industry veterans along the way. We will be putting together a group of pro riders and professionals from snowboard media, brands, retailers and resorts who will review the project as it’s developed and offer their expert analysis. This is a two year project so supporters and sponsors can breakup sponsorship over two years/budgets. We want this to be affordable enough for every person and business to be a part of it. We will count on all supporters and sponsors to help market the project including trailers and our Kickstarter campaign through their marketing and social media outlets. We will be putting together a Kickstarter campaign for individual supporters to get involved and will release information on this shortly. Logo placement on supporter page in all media releases and marketing outlays. We will work with the title sponsor to customize an impressive package to match the investment value. We plan to work toward a more of a traditional independent documentary distribution model. Step 3: Release on iTunes/Blu-Ray/VOD, and eventually Netflix. Continuing: Continued project updates and behind the scenes videos and trailers through all available media outlets and through supporter and sponsor outlets. Introduction – What is Snowboarding? Sound bytes from everyone in the movie, along with some of the best action shots. This will set the mood for the film. A Brief History of Snowboarding – Here we cover the roots of snowboarding and how it got to be the worldwide phenomenon that it is today. Example Interviews: Jake Burton, Terry Kidwell, Jeff Brushie, Terje Håkonsen, John Cardiel, Jamie Lynn, Shaun Palmer. etc. We will also look into the influence of skateboarding and surfing on snowboarding with interviews from Shane Dorian, Greg Lutzka, Tony Hawk, etc. A look At The Genres of Snowboarding – We will introduce the different genres within snowboarding almost like genres of music and the art. What makes up snowboarding such as backcountry, big mountain, powder, resort, park, pipe and street, etc. Backcountry/Big Mountain/Powder – We go in-depth into backcountry riding. Here we have interviews from some of the best backcountry riders in the world. Example Interviews: Travis Rice, Gigi Ruf, Curtis Woodman, Jeremy Jones, Mark Landvik, Pat Moore, Devun Walsh, Hana Beaman, Andreas Wiig, Jussi Oksanen, John Jackson, Eric Jackson, etc. Resort – 99% of people who snowboard do it at resorts and it’s not just about the terrain parks. We will discuss resort riding with several pros who spend many of their days riding chairlifts. Park – We go in-depth into park riding with interviews from some of the best and most creative park riders in the world. Example Interviews: Mark McMorris, Torstein Horgmo, Pat Moore, Scotty Vine, Halldór Helgason Eero Ettala, Tim Humphreys, Seb Toots, Chas Guldemond and many more. Pipe – We go in-depth into pipe riding with interviews from some of the best and most creative park riders in the world. Example Interviews: Shaun White, Danny Kass, Kazu Kokubo, Terje Håkonsen, Jeff Brushie, Danny Davis, Kevin Pierce, Gretchen Bleiler, Kelly Clark, Scotty Lago and many more. Street – We go in-depth into street riding with interviews from some of the best and most creative street riders in the world. Example Interviews: JP Walker, Jeremy Jones, Chris Bradshaw, Jed Anderson, Pat Moore, Dan Brisse, Forest Bailey, Louis-Felix Paradis, Scott Stevens, Jess Kimura and many more. Competitive Snowboarding – Here we will look into why halfpipe riding has become the face of snowboarding presented to the general public and look into why we compete in the first place. We will interview advocates for competition as well as detractors and allow them to discuss their views on snowboarding competition. Media Driven Snowboarding – Here we will look into the riders who build a career around an annual video part and how snowboard movies have shaped our scene. We also look at the newest class of pros…those who are now dominating the web with a constant flow of online content with a strong ability to market themselves. The Art of Snowboarding – Here we will look into just how creative snowboarding and snowboarders are and how that creativity is expressed on and off the snow. Many snowboarders are also writers, painters, photographers, filmmakers, musicians and artists of all kinds, and we will look into how that shapes our scene. What Does It Mean To Be A Pro Snowboarder? What makes someone a pro snowboarder today? How do they make their living? Snowboarding is one of the few “sports” where a rider can be considered a professional and not compete. Here we look into just how someone becomes pro in snowboarding. Working In Snowboarding – Here we will also look at all of the people who choose to continue to life the lifestyle of snowboarding. These individuals to work in the industry and build businesses in an effort to make money and continue to push snowboarding forward. The Snowboarding Lifestyle – Riding Because You Love To Live It – This is why everyone starts riding and continues to ride. This segment will wrap the film up and break it down to the simplest of reasons why we are all so invested in snowboarding and why it’s future success will also be ours.